In writing big band arrangements an ability to write for ensemble may be necessary not only for a shout chorus, but also possibly for the tune, the introduction, the ending, and any interludes. 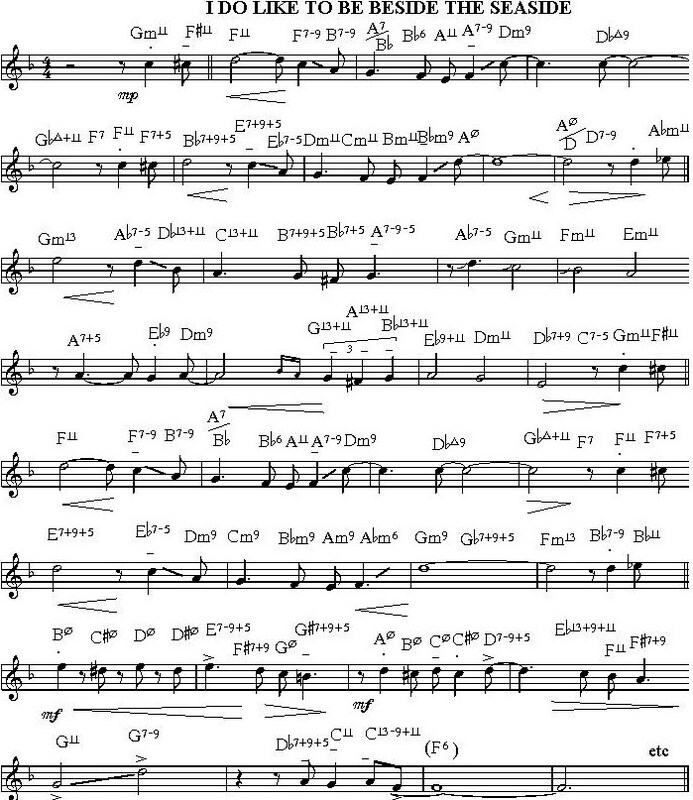 I have to admit that I am not an expert in this myself, but I have written some 200 big band charts and I would like to pass on some things I have learned to others who have yet to start writing such arrangements or who have only a limited experience of doing so. The examples I will give are mostly found on videos of my own band on youtube. Click on where it says Youtube if you want to hear the whole thing. This will put the extract into its context. The line-up of the big band I will be dealing with is what is commonly-found nowadays: 4 trumpets, 3 tenor trombones, bass trombone, 5 saxes consisting of 2 altos, 2 tenors and baritone, with maybe one or 2 of them doubling on soprano, clarinet or flute, and rhythm section - piano, guitar, bass and drums. Some of my arrangements are written for 6 saxes, but they can also be played with 5 without losing much. Below is a diagram of a keyboard which shows the name given to notes in different octaves. Middle C is C4. Between C4 and C5 the notes are all followed by the number 4, eg. Db4, B4. This applies in a similar way to the other octaves. A true unison involving all the horns can only apply to a few notes, say Bb3 to about G4 on account of the different ranges of each instrument. This is at the very top of the baritone and bass trombone range and is rather low for the trumpets to be very effective. When we talk about unisons then, it covers octaves, double octaves and triple octaves, and so on. Some instruments may have to swap octaves occasionally where the line goes out of their range, but this will not be readily noticed as it will be covered up by the other horns. Make sure that you pick a good point at which to swap octaves so that it makes sense and is easy to play. Eg. The G for the altos in the second bar may be too high for certain players. The following F - a long note - should be fine, so you can either risk it, or the G can be omitted or the bottom line can be played. In the stave for trumpets, the high G in the second bar should be able to be played by the third trumpet player (but perhaps not by the fourth). The A may be a bit risky so I've put the third player down an octave. Much depends upon the capabilities of the players you are writing for. If you are writing for an unknown band, err on the side of caution. Unisons can be very powerful but do require good melodic lines to come over well. You cannot hide weak lines as you can sometimes do when they are harmonised. In any case do try and avoid weak lines. The piano, guitar and bass can sometimes be included in a band unison. This is not something you can do very often - a little bit of this goes a long way. Where the bass and drums are laying down the time, especially in a fast number, it is not practical to give the piano and guitar rapidly changing chord symbols to play. It is much more feasible to get them to play unison with the horns or not to play at all. Besides which, if you want a band unison you don't want to destroy the effect by having piano and guitar chords cluttering things up. If the line is quite difficult or is more of a line suited to the horns it may be an idea to make the piano, guitar, and sometimes even the bass, tacet. A lot depends too upon how good these players are at reading. Horn players are used to being part of a homogenous section in playing unisons and harmony parts, whereas rhythm section players have other functions and the distance they are seated away from the horns makes it more difficult to synchronise with them to get things nice and tight. Where do you use unisons? It can be at the start of an ensemble chorus, building intensity later on as you add harmony. Or where you may want a basic sound without harmony deflecting from the melodic line. Or it may be as a contrast to a densely-scored passage. Or where you want to make a contrast between a solo instrument and the rest of the horns. Here is an example from a tune called The Golden Hind which starts off with all the horns, except the trombone soloist, playing unison and then going into 2-parts. Bearing unisons in mind, you have to be aware of the different levels of resonance and power in the ranges of different instruments. Trumpets below A4 can sound rather flabby, (Flugelhorns have more body in this range). From Bb4 to Bb5 they can be very powerful. Above that, if you have good high-note players, they can be overburdening. It is not a good idea to use such high notes for anything below mf. Playing up here can also be tiring on the lip so do include frequent rests. Do not put the third and fourth trumpets up so high - they are used to playing lower notes so they can be put an octave lower. The extreme range is also out of the question for flugelhorns and trumpets in mutes. Adding trombones to low register trumpets can make the brass sound more powerful as the trombones from, say, Bb3 upwards can be very strong. The overall sound will have a trombone edge to it. Some trombonists are not so good at playing much above F4 so they may have to be put in the octave below, and this is always the case with bass trombones. Lead trombonists can usually play up to Bb4 and higher but as in the case for the trumpet players, give them breaks to spare their lips. I like to think of the trumpet section as being the icing on the cake, ie. used sparingly. Trombone players also like to have a break from playing all the time. If you give brass players long rests it is helpful to provide cues to help them come in when needed. Miles: Why do you solo for so long? Coltrane: I never know when to stop. Miles: Well, try taking the goddamn horn outta your mouth! Talking about saxes, from D4 to D5 you will get a high alto-like sound from altos and tenors in unison. Adding the baritone from D4 to G4 will not change it over much but it will be noticeable, so best to omit it if you want an unblemished light-weight sound. Adding the baritone an octave lower will give the line more weight. With tenors and altos unis from E3 to E4 the tenor sound will predominate. If you include the baritone here it will become even heavier. Altos an octave above the tenors and baritone will still get a tenorish sound but with an overtone. If the baritone is by itself an octave below the rest of the saxes it can draw attention to itself, so I prefer to use the second tenor to double the baritone at such times. Sopranos, played by alto, tenor or baritone players, will lighten up the sax section and give it a modern sound. Using a soprano will blend better than a clarinet. Soprano and flute in unis, particularly from D5 to D6 (depending upon whether the flute is amplified) produces a sound like a human voice. Combining brass and saxes in unison can take the brassiness away and make the line more liquid and fuller or mellow, depending upon the dynamics. This applies to trumpets with altos, trombones with tenors and bass trombone with baritone as well as to other combinations. A unison line with an occasional chord can be used where the chord is accented. I have found that a four or five note chord is all that is required, but all the notes will be doubled once or more. The example below is from a tune called Together we can which builds up into ensemble with sporadic chords. Each instrument has to go from the unis line to the chordal notes nearest at hand. This might necessitate changing octaves beforehand and afterwards. You can use 3rds, 6ths and occasional 2nds, 4ths, 5ths and 7ths without any problems if they sound ok with the bass line. If a smooth sound is required stick mainly to 3rds and 6ths, angular sounds and oriental sounds may need 4ths and 5ths. For special effects you can use 2nds and 7ths. Be sure to balance the parts so as not to drown out the lead part unless you deliberately want a quasi-descant. This is a tune of mine called The Trump shall sound...and the twit will tweet played here by the One World Orchestra in Brighton led by Paul Nieman. 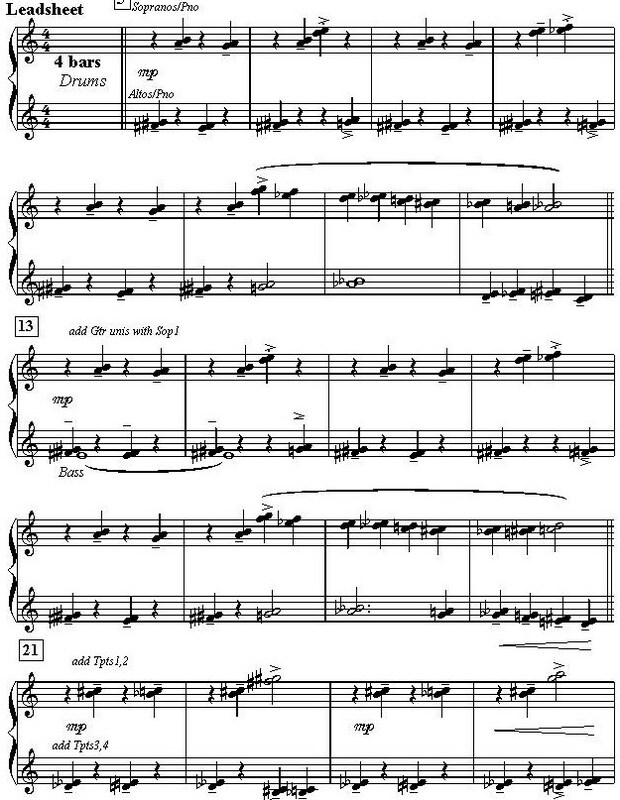 It is scored for 2 major seconds playing alternate notes of the tune, the sopranos and piano play the top line and the altos and piano play the bottom line. To find out what he tweeted, play to the end when it stops (unlike his tweets which never stop). It is also possible to divide the band up into brass unis against sax unis. Be aware that there may be 8 brass and 5 saxes so an inbalance exists which may have to be mitigated through the use of brass mutes, dynamic markings or adding guitar or piano to the sax line. Horns can in addition be in interplay with the rhythm section (unis). This will be high against low respectively. A variant on this is to add the baritone and/or bass trombone to the rhythm section parts. Three-note chords can sound rather dreary, but there are things you can do to prevent that. Triads moving to unexpected triads can be refreshing. This ensemble passage is made up of simple triads with a pedal bass (root and fifth). It might sound cheesy on the piano, but it can be great when horns double up and play the three notes in different octaves. In 3-part contrapuntal writing the most obvious set-up is trumpets, trombones and saxes (usually with the bass playing time). The trombone part will tend to be the lowest one so be aware that the lower you go with the trombones the less they are able to play fast passages. You can also mix up the parts, for example, 2 trumpets+2 altos - 2 trumpets+2 tenors - trombones+baritone. Ensure that each part is meaningful and none of the parts feels neglected. The usual methods of developing motifs can be used with good effect - repetition, sequences, inversions, etc. even if these have to be tweaked a little, if this is what you want to do. Four-part divisi writing is a different case, by which I mean 4-note chords. For most Swing era big band arrangements, this was the norm. Sammy Nestico is a master of this style. In close voicing this is sometimes called the thickened line. By dropping the second note from the top down an octave you get the widened line (useful for the saxes and trombones). Lines harmonised in 4-parts can sound very fluid. 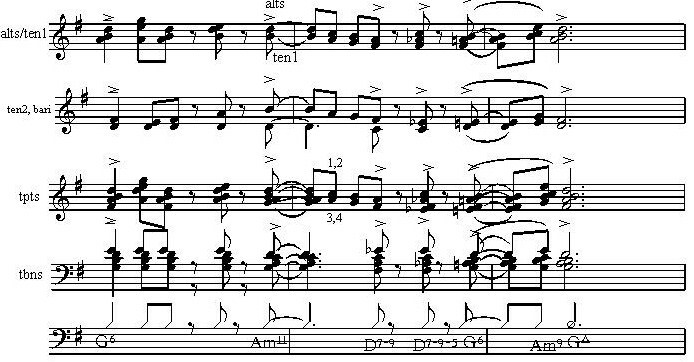 Here is an extract from a tune called Illusions which uses mainly 4 parts with an occasional 5th added here and there. The main chords used are 6ths, minor 6ths, major 7ths, min maj 7ths, min7ths, dominant 7ths, diminished and half-diminished chords in all inversions. As root notes are not needed in moving eighth-note lines, major 9ths are substituted for by minor 7ths built on the 3rd and so on. However there are times usually when the rhythm is more fragmented when the bass trombone or baritone plays the root notes, but not both which can sound too grounded. The reason why the chords sound so full is each note is doubled by two or three horns in different octaves. Notes in the inner parts follow the contours of the lead instrument, eg. C6 D dim D# dim Cmaj9(E bass). Where the lead trumpet plays in a moderately high range, say up to Bb5 the trumpets tend to be voiced in close position with the trombones doubling them an octave below and the saxes either doubling the trombones or playing in a more open voicing with the lead alto doubling the second or third trumpet. When the lead trumpet goes higher, the trumpets are often voiced like a triad with the fourth trumpet an octave below the first and the lead trombone doubling the second trumpet an octave down. There are lots of variations in this style. My own preference is for the lead alto to double the lead trumpet and so on down with the baritone doubling the first or second trombone. This gives a less brassy sound and is ok as long as there is good intonation in the band. When the lead trumpet goes too high for this (around F5) I double the 2nd or 3th trumpet with the lead alto. If you have a soprano in your band, you don't have any worries and can double the lead trumpet throughout. With the lead trumpet over D5 there is a danger that it will not stand out and needs support either by having the fourth trumpet or lead trombone doubling it an octave lower...this is essential in 5- or 6-note voicings. When the lead trumpet part goes low, G4 downwards, it is sometime necessary to get the 2nd trumpet to play unison with it. This can also apply to doubling the 3rd and 4th trumpets below this. Maybe this is not what you are supposed to do, but it works for me. I find the easiest way to orchestrate is by writing out the lead line for the trumpet and add the other trumpets (in nearly always close position), then add the trombones below this and then add the sax parts. The lower trumpets which are least powerful should be doubled by the saxes. There are alternatives to the swing-style chord sequences mentioned above. One is a modal approach where the chords are all derived from the scale of the chord (eg. Dm7 = D Dorian = C major scale - apologies to pedants). See b) below. Chromatic notes can be accomodated by parallel planing - going up or down a semitone from the first chord or to the second chord. Another way is to keep the intervals the same in harmonising each note in the lead. See c) below. The third way is by choosing any other chord which fits, especially if this produces an interesting line for the instruments below the lead. See d) below. Four-note chords can also be derived from adding a foreign note to a triad - see this pdf file. These have a built-in discord so it makes them sound interesting. You can mix various ones up to create a whole new harmonic basis. Experimenting with what works on the piano is one way of doing this. Here's what I did in Major Peter peters out. I've started it from a while beforehand to show how this device can be incorporated. It actually starts at about 2m17s. Five- or six-note chords are very common in jazz nowadays. Don't be tempted though to fill all gaps in a chord with other notes to make it richer, particularly in the sax section. The danger is that they will sound like loose links and will take away from the powerful sound you already have. This applies particularly in loud and disjointed passages. In quieter more legato pieces you may be able to get away with it, but it might be wise to double the added note with the same note an octave below. Clusters can sound good either at the top of a chord in the trumpets/saxes or in the octave below with the trombones. You can even treat the notes of a scale as a chord. In Chipper Flipper I voiced the trumpets in thirds (in cup mutes) (E5 C4 A4 F4) with the saxes also in thirds between these notes - D5 B4 G4 E4. Together they made up a Dm9 chord or a D Dorian mode. In these larger chords you will often come across minor seconds. Provided the band can play in tune, this should not be a worry. Ignore anyone who says you shouldn't do this. With block writing, do remember that players have to breathe - actually a good point to remember in general! In the gaps you can have piano bell notes, drum fills, or a solo by someone. Block ensemble passages are good for building up to a climax - up to high notes and more rhythmic, as indeed is the type of writing in the next heading. Note that in all of these styles, each section must be resonant and complete in itself. This doesn't mean to say that in a brass chord the trumpets and trombones must both state the same chord. 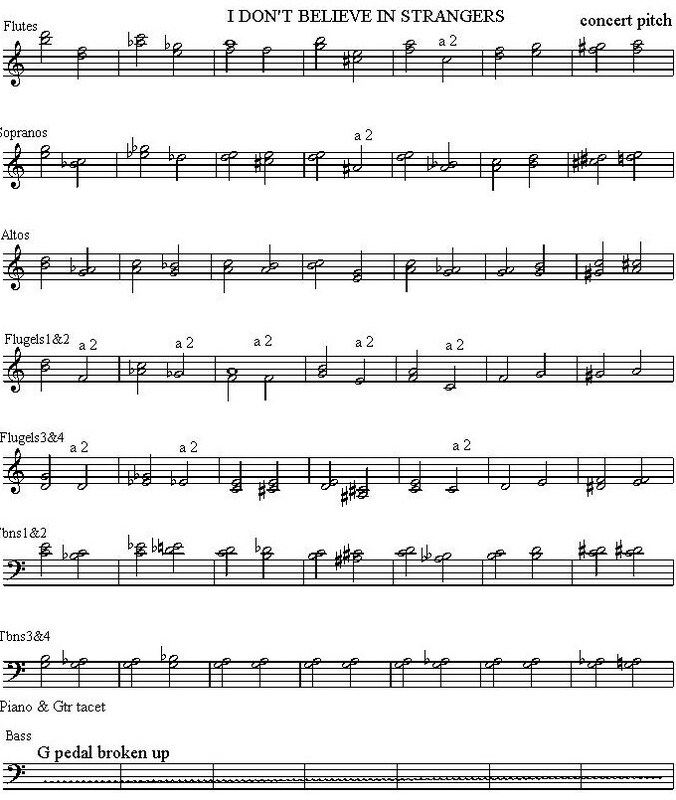 For instance in a Bb13+11 chord, the trumpets may be playing (from the top down) a C6 G5 E5 and C5 ie. triad of C major, with the trombones playing G4 E4 D4 Ab3 (and maybe the baritone supplying the Bb2 root note if necessary). In general try not to double the bass note of the chord an octave above. In this piece called Beachy Head I have used clusters either on top of the chord or at the bottom (between F3 and F4). I am referring here to one section, say the brass, being div and the other, saxes, being unis. This is good for when there is a fairly lengthy gap between the phrases of the brass and saxes although the different sections may become closer together as things develop. Here is an ensemble from the tune of Romero where the trumpets are unis playing the tune, the saxes are playing counterphrases and the trombones are playing divisi chords. Write the lead lines first and then fill in the harmony later or you might lose the flow. Don't let the brass drown out the saxes. Another example of call and response is when the saxes are div and the brass are unis but in octaves. This approach is not as powerful as the above but can work well if the saxes are voiced in a powerful way (high lead and fairly dissonant chords). Also works well if the brass are playing a broken-up stacatto line with the saxes playing legato chords. You can also have trumpets unis and sax and trombone chords - good for early stages of an arrangement but not for the later big climax. There is nothing to say you can't mix up unis and divisi for each section. This is the ensemble part from Box and Cox in which each section comes in here and there and plays a phrase or even a single note or chord. The essential element of this is to vary the sound continuously and keep changing which section is playing the lead or backing chord. So far I have had in mind the horns harmonised in a flowing line. However some of the time they will be playing more static parts. When you want this, either the baritone or the bass trombone will play root notes of the various chords and the lower voicings will be more spread out. Here is an example of an old music hall song I do like to be beside the seaside which I have reharmonised as a slow bossa. It works nicely with flugelhorns or trumpets in bucket mutes as well as trombones in buckets. Each note is harmonised with a different chord using higher extensions of chords as much as possible to create a lush sound. The chords have been simplified or modified for reasons of space. Instead of, say, F7sus4 or Cm7/F I have notated such chords as F11. Stabbing brass chords in particular which often occur will also use wide-spread chords with root notes. Saxes can be added when you want all the horns to play, for example behind a guitar solo. I did this with Nemocracy. The guitar solo is first of all just with the rhythm section and then trombones are added, then trumpets and then saxes. In this example, a tune called Vortex the ensemble chorus is in this style rather than being a harmonised quasi-solo line. It is not easy to play! When the tune comes back in shortly afterwards at 4m56 it is mainly voiced in close position 4 part harmony plus a bass line. If you are lucky enough to have flutes, clarinets and sopranos in your band you can use them like a woodwind section which can be combined with the brass in mutes (cups work well as do flugelhorns). Here is the introduction and first 16 bars of I don't believe in strangers. This is a densely harmonised line so wide in overall range I was unable to play it over on the piano. This shows how the woodwind as opposed to purely saxes give things an entirely different sound. Finally, two tricks of the trade which can come in handy. When you want no gaps (rests) in a part which would require places for players to breathe, such as a note held for a very long time, you can divide the section into two or more. 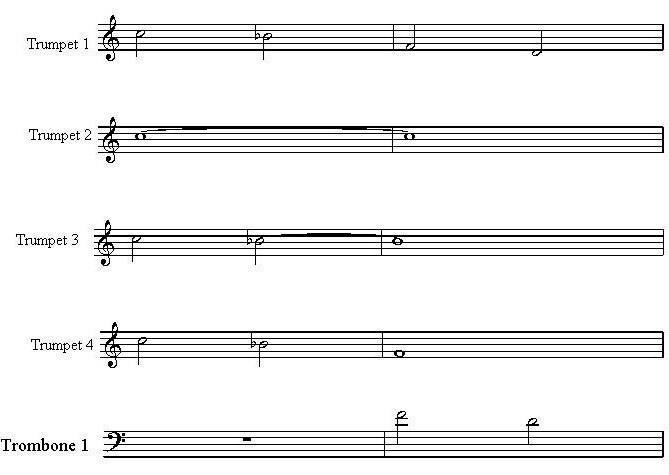 The notes are staggered so that it sounds out-front as if it is a continuous long note. See below as an example. Maria Schneider uses the phrase creep in. This is shown by the dynamics. You don't need to use both. The other "trick" which is not used that much in jazz is when you want to imitate a sustain pedal on the piano, but using the horns, so that each note is sustained after being played although the actual line continues. Here is an example from Star Track. The first time the tune is played there is no sustain effect, the second time there is. This is a more complex arrangement using this technique. 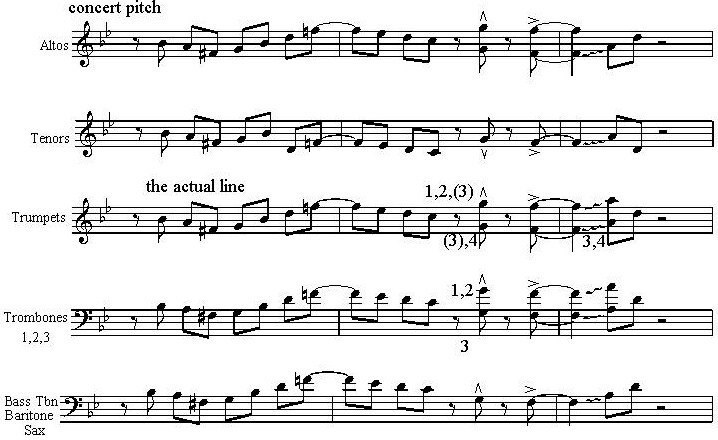 The first phrase has the lead trumpet play the lead while the second phrase it is the lead trombone, and so on. The guitar acts as a unifying factor and plays the whole tune to prevent it becoming fragmented. In the second part of the tune where the bass comes in the trombones play chords and the saxes just sustain notes of the tune. Writing for a big band can be very rewarding and offers you a lot of scope to express yourself in different sounds. I hope this tutorial will be useful. Good luck!